We would really appreciate you taking the time to complete a short survey about living with HAE. Please follow this link to participate. Have you seen our inspirational short video, showcasing the achievements of some of our members? You can view it by clicking this link. What is Hereditary Angioedema (HAE)? HAE is characterised by huge swelling of the tissues (angioedema) which last from 3 to 5 days. These swellings can occur on any part of the body; hands and feet, arms and legs, trunk, intestines, genital organs, face, tongue, neck and airway. ​HAE UK started as a small patient support group in October 2010. We became a registered charity in 2013 (charity number 1152591) and now have a team of dedicated trustees, medical advisors, Laura (CEO), Rachel (EO), Alex our Youth Ambassador and a small team of volunteers. 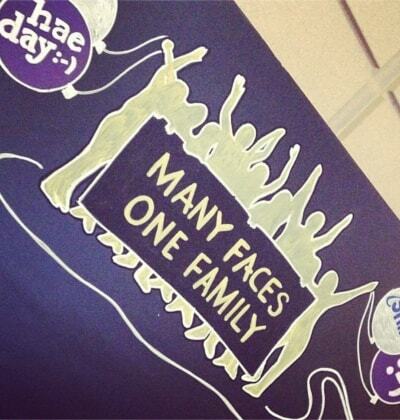 ​The HAE UK event calendar contains details about awareness days, members fundraising activities, Huddles, HAE international conferences and details of our very popular annual patient event in November each year. Hereditary Angioedema (HAE) is a rare but potentially life-threatening inherited condition. HAE symptoms include episodes of oedema (swelling) in various body parts including the hands, feet, face and airway. In addition, patients often have bouts of excruciating abdominal pain, nausea and vomiting that is caused by swelling in the intestinal wall. Airway swelling is particularly dangerous and can lead to death by asphyxiation. HAE patients frequently spend a long time before they are correctly diagnosed. They are often referred to allergy, yet their swellings will not respond to antihistamine or steroids. Some of them with abdominal swelling are subjected to unnecessary exploratory procedures even going so far as to have appendectomies or bowel surgery; some are even considered to have psychiatric problems (it is no coincidence that Hereditary Angioedema used to be called ‘Angio-Neurotic Oedema’). One of the diagnostic features is family history; prior to the condition being identified, about 30% of patients died from lack of treatment. And yet treatment is now available, is easily administered and is relatively inexpensive. Patients with Hereditary Angioedema either lack a regulatory protein called ‘C1-Inhibitor’ or their C1-Inhibitor has very low activity. Most patients have a family history, but some are spontaneous mutations. The problem is, these mutations can be passed on to offspring. C1-inhibitor can either be replaced directly, by using a C1-Inhibitor concentrate; or the process that it controls can be interrupted by use of a bradykinin antagonist. There are some more complicated conditions that are very similar to typical HAE, but are classed as ‘HAE Type III’; identification of this subtype is increasing exponentially. There is also Acquired Angioedema – AAE – who are people who have angioedema as a side effect from treatment for other illnesses. You are welcome to contact HAE UK Patient Support to discuss your HAE needs in confidence. Because HAE is such a rare condition many patients have never met another person with HAE. We all have our own individual journey as we seek to access the correct diagnosis and then to achieve good management of our condition. Many patients feel that they have a good management programme that gives them good control over their symptoms. Sadly, there are still patients who struggle to access the type of treatment recommended in the 2013 NHS England Policy for the Management of Acute Attacks of Hereditary Angioedema and the 2014 UK Consensus Recommendation for the Management of Hereditary Angioedema. Some of our HAE UK members have told their HAE story to share their own experiences in order to help and encourage others. If you are experiencing difficulties in accessing treatment please do contact our HAE Patient Contact to talk about your situation. HAE affects between 1/10,000 to 1/50,000 of the population. Because it is so rare most doctors would not see a case in their entire career, and misdiagnosis is common. Patients can suffer for many years before they receive the correct diagnosis. HAE patients have a defect in the gene that controls a blood protein called C1 Inhibitor (C1INH). C1INH is part of a complex cascade of reactions that control the release of fluids from capillaries into the surrounding tissues, thereby causing oedema (swelling). Type I and Type II HAE are due to a known genetic mutation. There are low levels of C1INH (in most cases). The blood levels are normal but the C1INH has impaired function. This is a very recently documented form: It mainly affects females and is exacerbated by high oestrogen levels e.g. oral contraceptives and pregnancy. HAE Type III is not due to C1 INH deficiency; it is linked to elevated levels of bradykinin. The exact reasons it occurs are still being studied. Acquired C1 Inhibitor deficiency is not inherited but is caused when the body produces an antibody to its own C1 inhibitor or uses too much C1 inhibitor. AAE is often associated with an underlying condition of white blood cells, which is usually mild, but tests should be done to exclude more serious conditions such as lymphoma.